Therapy dogs love their jobs. Is your pup cut out for it? A new study finds that therapy dogs get as much joy from their jobs as they give. I was raised with the understanding that dogs are family. My fiancé and I are strongly sticking to this thinking and regard our two dogs as the most important creatures on the planet. We’re always thinking of ways to maximize their happiness. Our senior girl, Netta, has bad arthritis and a less than affectionate attitude toward strange dogs. She’s most content just cuddling in bed; but our new rescue, two-year-old Josepher is outgoing, sociable and eager to learn new tricks. A few months into a splendid life with Josepher, we’ve been contemplating getting him trained to be a therapy dog. It would be a meaningful experience for me (as his potential handler) having spent much of my childhood in the hospital with my twin brother. I don’t have memories of a therapy dog being around us back then, but I can imagine how happy such a visit would have made us. I’d like to visit a children’s hospital with Josepher and maybe bring just a little bit of cheer to an environment I remember as being so stressful and dreary. But how do I know my dog is right for the job and would he actually be happy providing such a service? A new study published in “Applied Animal Behaviour Science” helps to answer that last question. 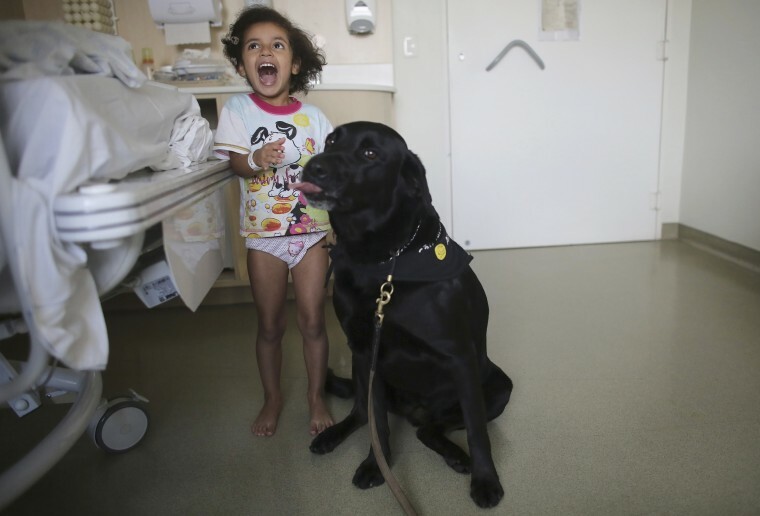 The research, which considered the work of 26 therapy dogs in pediatric cancer wards, found that the dogs weren’t the least bit stressed by the work and even expressed joy in doing it. A study of 26 therapy dogs in pediatric cancer wards found that the dogs weren’t the least bit stressed by the work and even expressed joy in doing it. The researchers found that the dog’s cortisol levels were stable, meaning they weren’t stressed. To deal with the question as to whether the dog was not only not stressed but also happy doing therapy work, the researchers videotaped the sessions of the dog interacting with the children. “We coded them for behaviors the dog was exhibiting, [identifying] stress-related and affiliative or friendly behaviors. We'd check off every time we saw behaviors like tail wagging, lip-licking [a sign of anxiousness], looking toward the child or turning away. We observed that behavior for the 15 to 20 minute sessions to get a context of the interaction.” The research team also had the dog’s handler fill out report to inform what they did, and who else aside from the child was present. This is a win-win-win. The handler enjoys showing the dog off and volunteering, the [patient] enjoys the dog and the dog likes doing it. The study’s findings come as no surprise to Dr. Gary Richter, veterinary health expert with Rover. Dogs of all types can be fit for service, but certain traits play a role in their success at the tasks at hand. One characteristic is non-negotiable, and that’s the dog’s demeanor. Your dog will definitely need to go through a certified training program to work with the general public. You can get started by signing up with a local training facility, like Zoom Room, which may recommend a series of basic obedience trainings before getting started with a therapy training program. And remember, if your dog isn’t a fit, you can always make a donation or look into fostering a therapy dog. Gillihan has seen a tremendous spike in the need for therapy dogs, particularly with the surge of gun violence and natural disasters — both situations where survivors are greatly in need of comfort. Another area where Gillihan is seeing increased interest is at airports. It's Not Just a Hunch. Some of Us Love Our Dogs More Than Other Humans.